I've decided to take you through a few of the treats that I've made for Easter in the past. Some of them were made to order. The others, for friends and family. I hope you enjoy them!!! This is a very short post on my version of Easter Cupcakes. Last Easter, I made a ton of marzipan chicks, eggs, bonnets etc. to order. When I was done with those, I decided that I needed a change from all that. So I turned to my favorite Chocolate cake recipe - its a Nigella Lawson recipe, my no-fail, go-to recipe for a great chocolate cake. 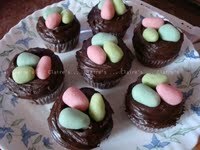 I made some chocolate cupcakes topped it with Chocolate frosting and placed 3 marzipan eggs on the top. I like how they turned out. The only thing I will do differently when I make them next, is reduce the size of the eggs a little. I've added one of my favorite marzipan recipes. Click here to view it. I love these easter nest cupcakes! Would you be so kind as to link up to Muffin Monday and share the recipe. I know our readers will love it! Thanks so much for sharing! Thanks Katheryn ... will do that this coming Monday! Thanks for linking up Trisha! Our readers will love your recipe!